​Black light works in most environments. It only requires the lowering of lights, but the darker you can make it, the more dramatic the effect for the audience. 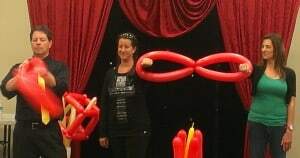 The Art of Inflation interjects fun into an event, and its flexibility allows park district directors to use this show for special events that require a great family-friendly show that gets an audience laughing. Twisted silliness and creativity is not just left to the kids- parents are involved too!